Flywheel: stock Buick 215, machined flat. Tires/Wheels: Shelby 14 x 7 (Datsun) Minilite copies with 195/70 tires. Suspension: chrome bumper front crossmember. 1-1/2" lowering blocks and stock GT springs on rear. "Evolution" front and rear sway bars from M&G International. Cooling: radiator relocated to 1977-80 location. 16" thinstyle electric fan. A/C condensor with 12" fan. Other: (1) MSD G-A Ignition. (3) Chevrolet Vega starter with D&D adapter nose. (4) GM 63 amp alternator w/ modified D&D brackets. 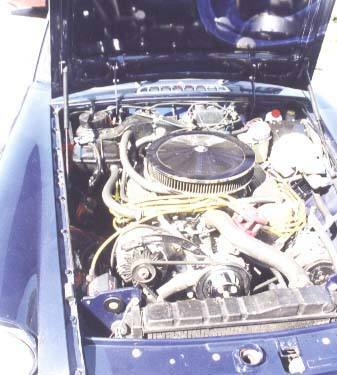 (5) air conditioning with Nippondenso compressor, dealer option MGB underdash A/C unit and fabricated mounts. (6) Pontiac Fiero seats with headrest speakers.